PHOTOCELL INCLUDED - Beautiful and redesigned with a pre-installed dusk to dawn photocell for the light to automatically come on and off! SUPER BRIGHT - Bring out the best lighting to your application with an incredible efficiency of over 95Lm/W using only 42W for over 3800 Lumens! SWIVEL HEAD - Easily adjust the fixture up and down with the installed swivel! Our Dark Sky Compliant head makes it easier to focus light on the needed area. 50,000+ HOURS - With an astonishing life rating of over 50,000+ Hours, this fixture will last over 21 Years with 6hrs/day use! 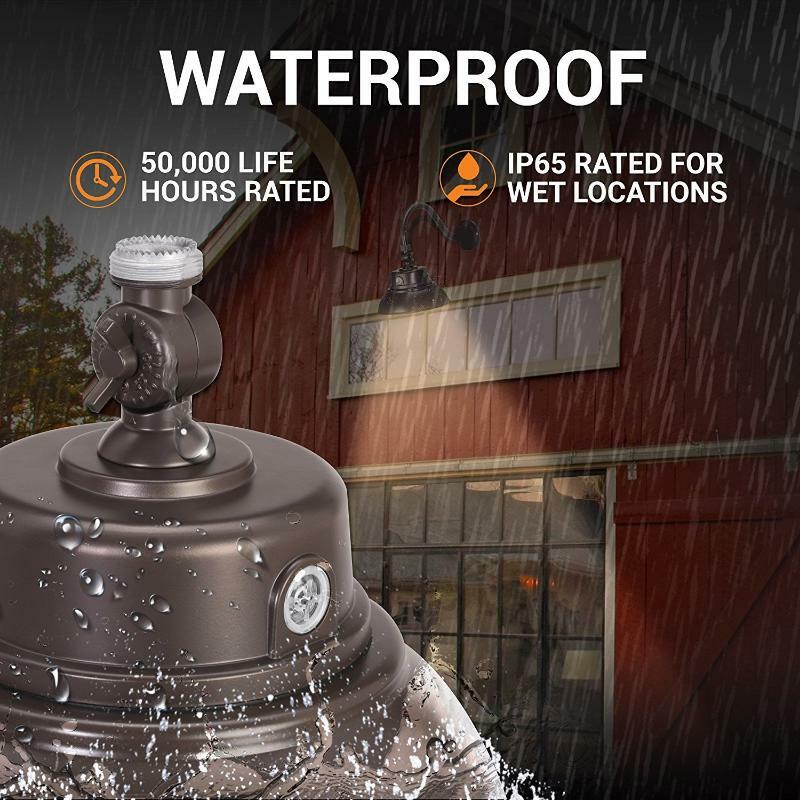 SAFE & RELIABLE - HTM Lighting Solutions Gooseneck Barn Light Fixture is ETL Listed, and Energy Star Rated, and comes with an unlimited hassle-free 5-Year Warranty! 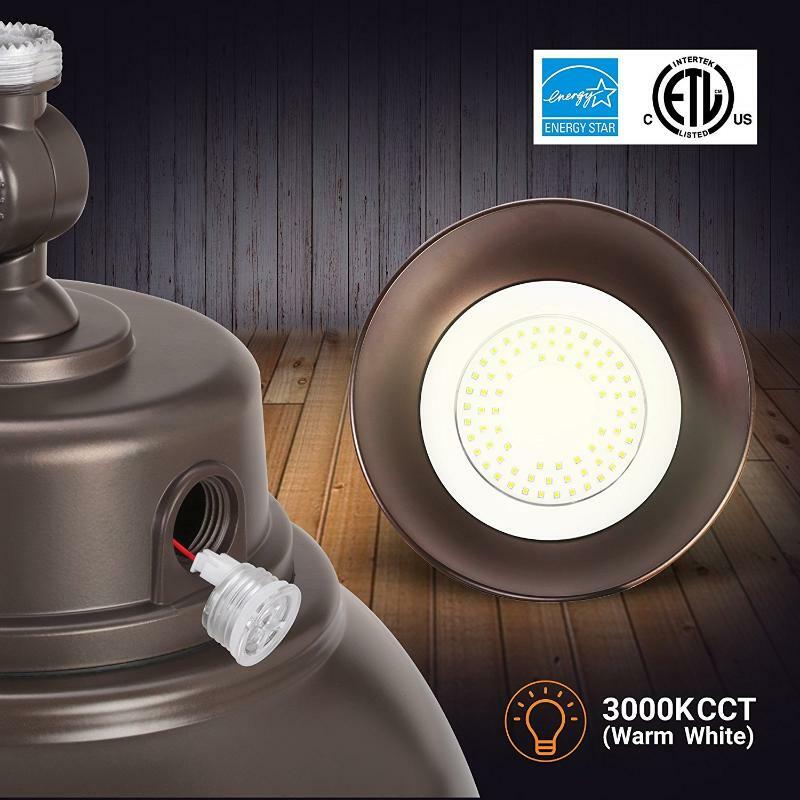 This beautiful redesigned gooseneck LED barn light fixture is ETL Listed & Energy Star rated, and will therefore work for residential, commercial, and industrial application! HTM Lighting Solutions NEW Modern 14 in. 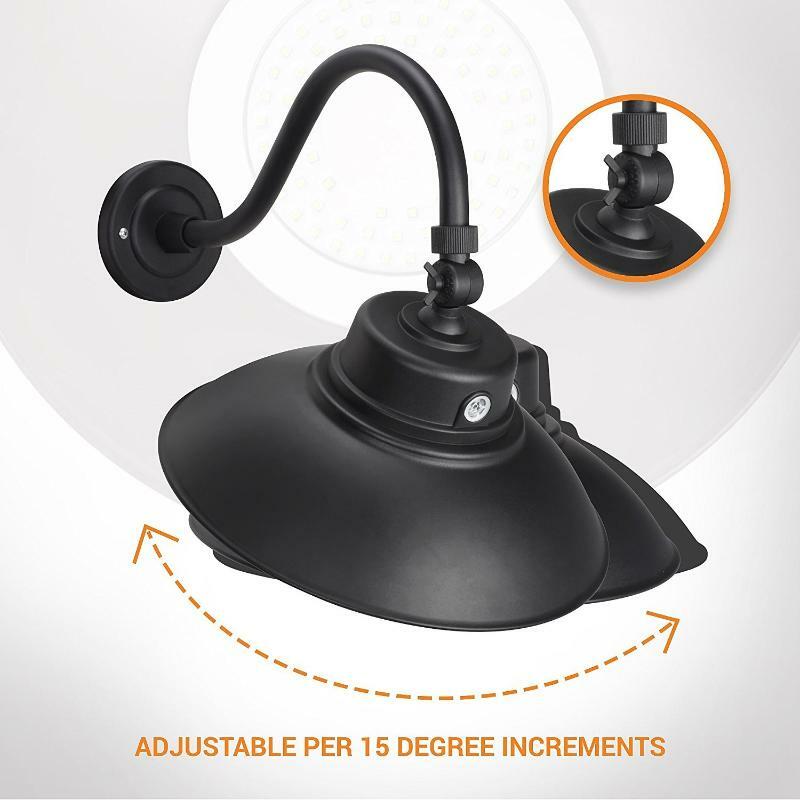 LED Gooseneck Barn Light Fixture for indoor and outdoor use comes with a complimentary photocell, and swivel head, and is extremely simple to install with the outdoor rated mounting plate. Each LED barn light fixture comes with a 14in. shade, with a 42W LED Module Board installed rated at over 50,000+ Hours of operating time! The internal LED Driver is rated for 100-277VAC. All you have to do for the installation, is to hard-wire the wires at your junction box. The fixtures come with 54in. wire length, so you will have plenty to work with! The swivel located on top of the 14 in. shade will enable you to angle the fixture up and down, to optimize the light spread on the wanted area, all while remaining highly efficient. 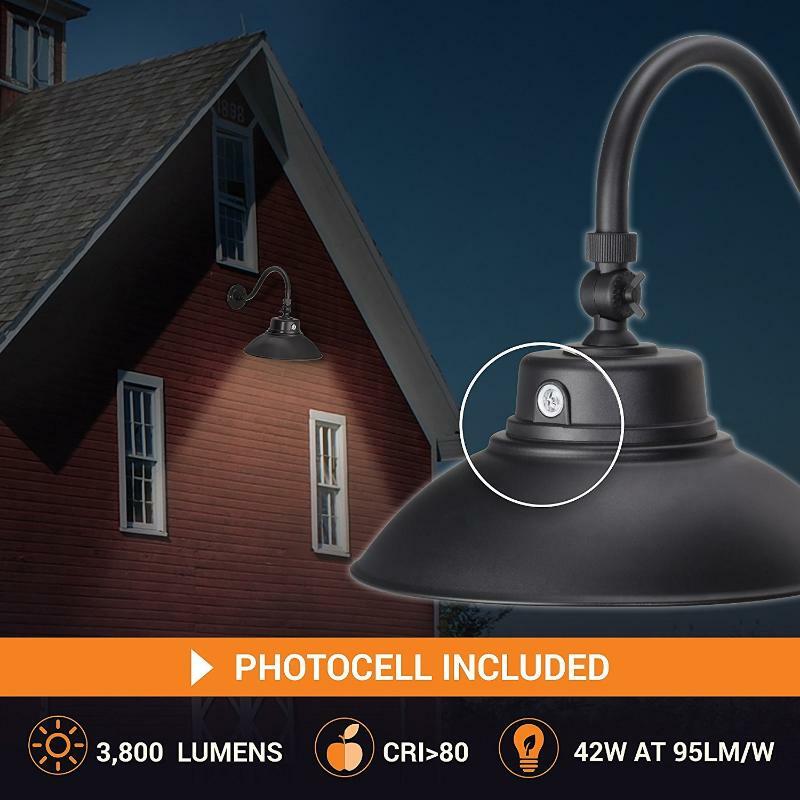 The complimentary dusk to dawn photocell will enable the fixture to turn on and off, so you don't have to worry about reminding yourself to do it! If the photocell is unnecessary for your application, it can be easily disconnected by simply unplugging the wire on the front of the fixture (located behind the photocell). Some great application for your new Gooseneck Barn Light Fixtures are: Sign Lighting, Barn Lighting, Awnings, Restaurants, Storefronts, Wall Lighting, Safety Lighting.